Orange County Mayor Teresa Jacobs and the Board of County Commissioners (BCC) hosted the Jones High School Concert Choir and Wind Ensemble for a performance at the April 10, 2018 BCC meeting. 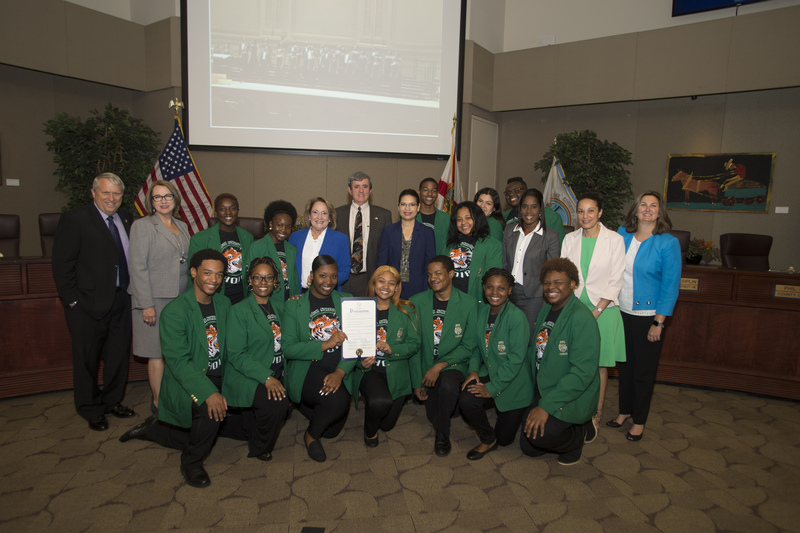 The BCC recognized the students with a proclamation after they captured the hearts of the nation following their guest appearance on the Ellen DeGeneres Show and for performing at Carnegie Hall in New York. The proclamation recognized the group, led by Choir Director Andrea Green and Band Director Jamaal Nicholas, for their dedication and commitment to excellence. Students from Jones High School’s Concert Choir and Wind Ensemble performed on the prestigious Ronald O. Perelman Stage at Carnegie Hall on April 8 as part of the WorldStrides National Youth Choir and National Instrumental Festivals. Jones High School was one of only nine schools in the nation invited to perform at the festival. In February, the group was featured in an interview on the Ellen Show to discuss their fundraising efforts to help pay for their trip from Orange County to New York. During their interview, talk show host Ellen DeGeneres surprised Jones High School with a donation of $100,000, courtesy of Walmart, helping them complete their fundraising goal for the trip. The group worked tirelessly to raise $100,000 prior to the donation. The school is led by Principal Allison Kirby and first opened its doors in 1895. The group also performed an original piece inspired by Orange County’s tagline “the best place to live, work and raise a family” at the BCC meeting. Photo Caption: Jones High School choir performs at the Board of County Commissioners’ meeting on Tuesday, April 10, following their performance at Carnegie Hall.